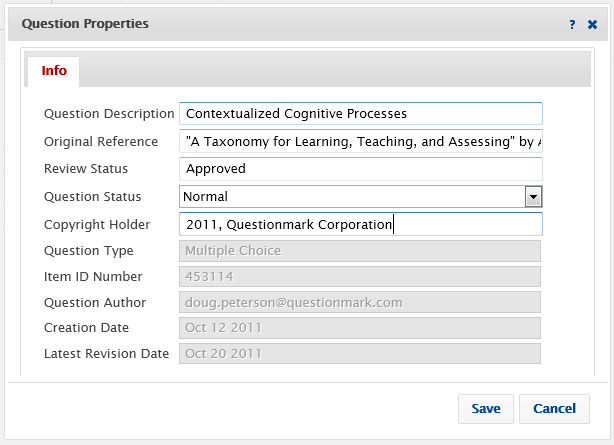 New in Questionmark Live: Question Properties! With the latest release of Questionmark Live browser-based authoring on October 13, you’ll see a couple of new things – the new Matching question type, the Embed Video button in the editing toolbar (to be discussed in my next blog article, coming soon! ), and Question Properties. In this article we’ll take a look at Question Properties. The first thing you’ll notice when creating a new question or editing an existing question is that the Edit Question Description button has been replaced by the Edit Question Properties button. Clicking this button will open the Question Properties window. Question Description is a short description of, or title for, the question. It defaults to the question wording unless you decide to change it. Original Reference is a free-form text field intended to allow the question author to reference the source of the question. This could be a chapter of a text book, a page in a manual, or perhaps a video to which the question pertains. Question Status controls the delivery of the question. Normal – a normal question that can be used in an assessment. Retired – the question cannot be used in an assessment and is just being retained for historical purposes. Incomplete – the question is still be developed and cannot be used in an assessment. Experimental – the question can be included in an assessment, but it’s score will not be included in the participant’s block, topic, or assessment score. This status is useful for trying questions out and gathering statistics. Beta – the question can be included in an assessment and behaves the same way as a normal question, but this value designates that it is in a beta testing state. Copyright Holder is a free-form text field where you can put copyright information. The next five fields cannot be edited. They simply provide the question type, the question’s unique ID number, the question author’s ID, the date the question was created, and the date when the question was last updated. Before the Apple® iPad™ hit the streets, we knew that it would be an immediate player in the education market. Its large, color touch screen has made the iPad the darling of college and corporate campuses. So we knew we wanted our Apple iPhone® App to work on this new device. We also wanted to make it easier for our customers to use the App immediately after downloading it. We added the ability for you to configure the App to connect directly to your Perception server install, whether it is On Premise or On Demand. Watch this short video showing you how easy it is to connect directly to your Perception server using our iPhone/iPad App today. If you haven’t played with the App, download it today! Just follow the link from our information page.